When we made the decision that we'd take on the role as General Contractors, one of the first premium products that we added into our project were "SIPs panels" (structural insulated panels), because of the money that we would be saving by not paying an outside G.C. to manage our build. Energy efficiency (as well as space efficiency) were always of upmost priority to us when the associated costs were manageable and the return on investment made sense. Fortunately, we have one of the best manufacturers of SIPs panels in the country right here in Indiana! Thermocore, who ships their products all over the world for new construction and for new additions to existing homes, is located in Mooresville, Indiana. There are so many benefits to choosing to build with SIPs panels for your exterior walls, as opposed to traditional stick framing. First and foremost, the exterior wall panels, as well as our roof panels, are heavily insulated. 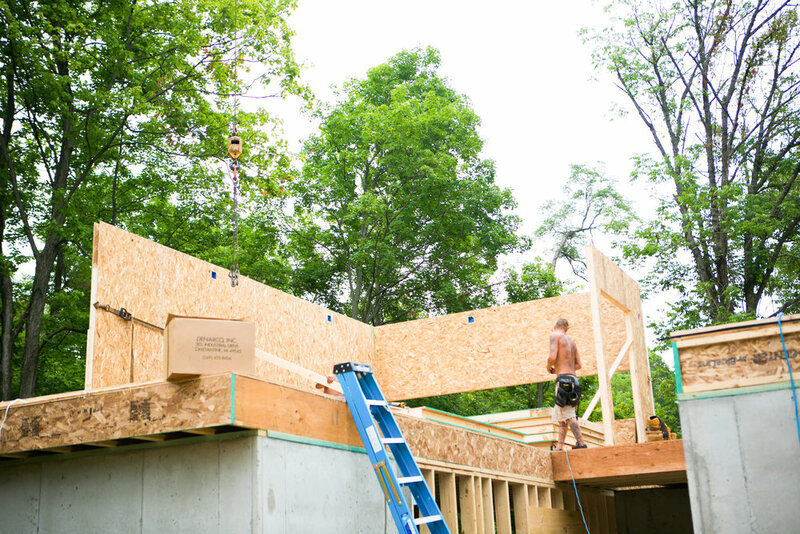 Our walls are comprised of 4" rigid foam sandwiched between layers of OSB, and our roof panels are made of 6-1/2" rigid foam with OSB on either side. The R-Values of these panels are R24 and R40 respectively. So what does that mean? That means that we save so much money heating and cooling our home. For example, in the coldest of winter months, our heating bill is $40 to heat our entire 3600 square foot home! It is also very consistent walking from room to room. Have you ever walked through a house, and some parts of the house are much warmer or much cooler? A drafty home is not the case when built using SIPs panels. They keep a very regulated temperature because of the reduced heating/cooling loss. Another huge benefit is the panels are built indoors in a factory, so they are not exposed to the weather elements during construction. When the panels arrive on semis, they are ready to be set in place, which greatly reduces the amount of man hours framing the exterior structure. A crane and a framing crew are used set the wall panels in place. 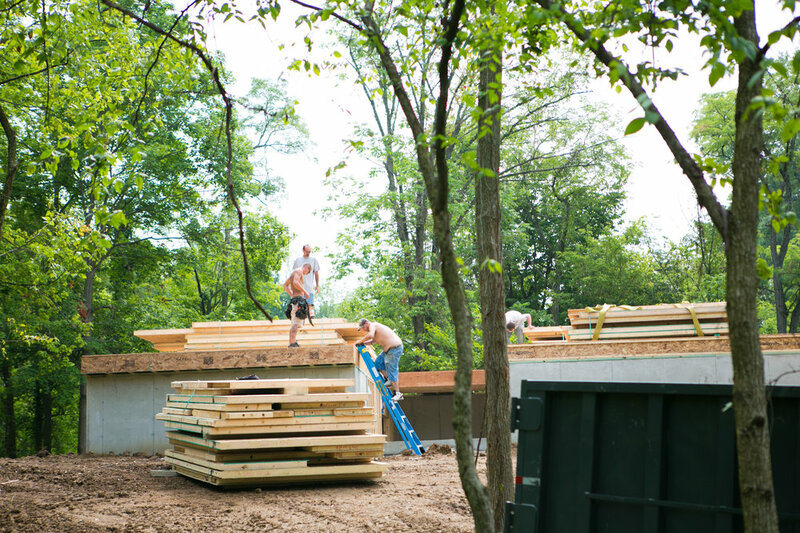 In a matter of a day (or even a little less in our case), our entire first floor was framed. This also reduces the amount of waste that a normal construction site sees. SIPs panels have so many other cool attributes. All of our electrical and window/door rough opens were cut by computers, taking the human error factor out of the equation. When our windows arrived and were set in place, the fit was perfect. Conduit is run through the foam wall panels where electrical is needed, structural headers are placed inside the wall panels where needed above windows and doors, and extra support can be planned within the walls if you know that you are going to have something heavy to hang on the wall (for example, our bathroom floating cabinets). Drywall is then nailed directly to the interior layer of OSB, making for a quick and easy installation. For the most part, it also makes hanging things inside the home, like wall art, mirrors, etc, super simple since you can just nail or screw right into the drywall and OSB. For additional information on building with Thermocore's SIPs panels, you can visit their website. We are very happy customers and would highly recommend them for your future projects!